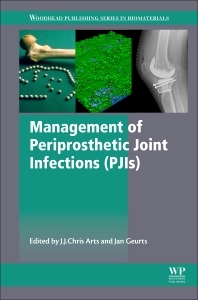 Management of Periprosthetic Joint Infections (PJIs): Management of PJIs discusses periprosthetic joint infection (PJI), a fairly rare occurrence that is nonetheless one of the most serious complications in joint replacement surgery. Intricate interactions between the pathogen, the host, and the implant can result in PJIs which are not only physically devastating for the patient, but also financially crippling for health authorities and insurance companies. Actions taken to minimize the risk of PJIs can be extremely challenging for the orthopaedic community. Consequently, new research, which is detailed in this comprehensive book, is being undertaken to minimize and manage these challenging infections. Dr. J.J. Chris Arts is Associate Professor Translational Biomaterials Research Maastricht University Medical Center, the Netherlands and Lecturer and Scientist at Eindhoven University of Technology, the Netherlands. He is also Cofounder of European Society of Tissue Regeneration in Orthopaedics and Trauma, board member of Dutch Society for Biomaterials and Tissue Engineering, Dutch orthopedic Society Biotechnology workgroup and a reviewer for several orthopedic and biomaterials orientated peer-review journals. Dr. J. A. P. Geurts is an Attending Orthopedic Surgeon, Adult Reconstruction Hip and Infection Unit, Maastricht University Medical Center, the Netherlands. He is also a Board Member of the Dutch Orthopaedic Society, Infection workgroup and a Reviewer for the Dutch Journal of Orthopaedics.